How to convert PPT to Video with Xilisoft PPT to Video Converter Pro? 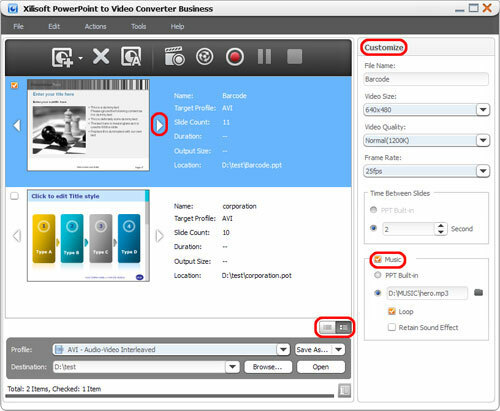 Convert PPT to video with PowerPoint to Video Converter Pro? Check the PPT file(s) you want to convert, select output profile, adjust parameters and set time interval. After preparing everything, you can convert PPT to video with ease. The PowerPoint to Video Converter has 2 additional editions: Free and Pro. All 3 editions work as converting PowerPoint presentations to different video files. The Free edition only supports SD video formats as output file with no sound and animation effect, while the other editions allow you to convert PowerPoint to HD/SD video with options to personalize the output presentation video. The Pro edition allows the user to apply watermark or trademark to their PowerPoint video, recommended for business and corporate users to protect their copyright.